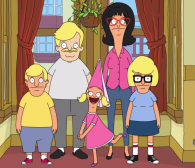 Bob’s Burgers Season 6 Premiered on September 27th, 2015. Bob finds an exercise bike in the back alley and is using it to help get in shape, the kids help by encouraging him, in their own ways. After finding a huge clump of hair in the shower, and having his family confirm that his bald spot is still the same size, Bob discovers he is losing his mustache. After Bob suggests shaving it off, to Linda’s horror, Linda tells the kids the story of how she and Bob met. Linda credits Bob’s mustache as the reason she fell for him. 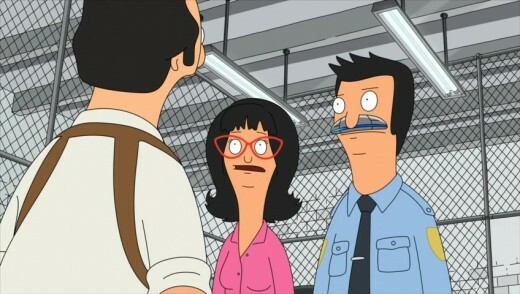 Gene and Louise then suggest that if Bob hadn’t had a mustache that he and Linda wouldn’t have ended up together. Tina, insists however, that they were meant for each other. Gene then tells his story of what would have happened if Bob had no mustache on the night he and Linda met. In Gene’s story Bob’s lip gets cut by Linda’s engagement ring, and he ends up at the hospital. At the hospital, officer Bosco commandeers Bob and puts him into a coma. When Bob wakes up, he is officer Robostache and remembers nothing of his former life. As Robostache, Bob is a nitpicky cop. He runs into Linda again. Now that he has a mustache, Linda finds Bob attractive and the two of them go out for coffee. When Bob and Linda Kiss, Bob’s mustache shocks her. Wanting to continue her romance with Bob, Linda goes with him to the police station in hopes of turning down the voltage on the mustache. Officer Bosco reveals that doing so would cause Bob’s brain to explode. 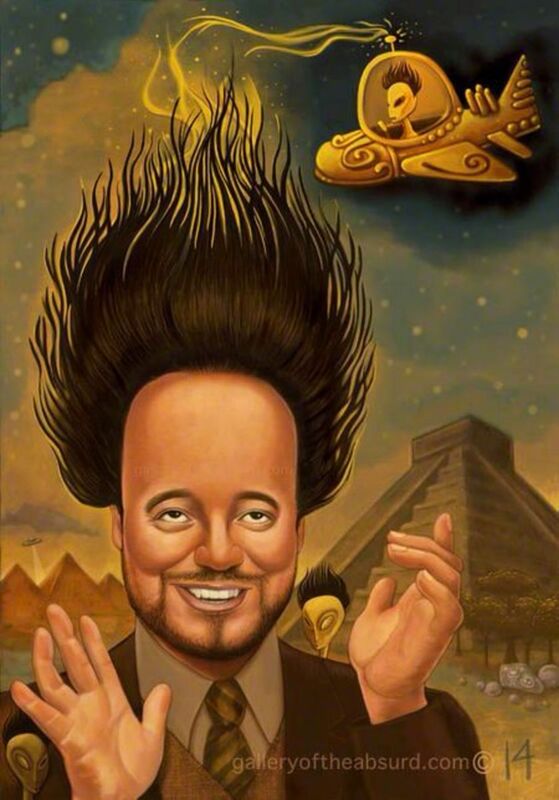 Then reveals that Robostache was specifically created to drive out the people of the town so that Mr. Fischoder can build his dream Wonder Wharfopolis, an amusement park the size of a town. When Bob tries to arrest Bosco he discovers is unable due to secret directive number four. 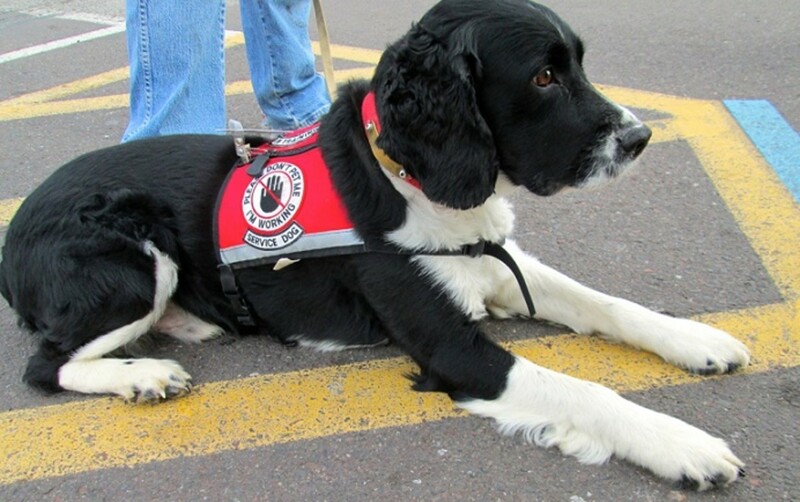 Bosco then reveals he is Mr. Fischoder and Bob declares that he is under arrest. The two then get into an epic battle, Bob’s mustache against Mr. Fischoder’s robotic eye. Bob is defeated, his mustache falls off and his brain explodes. His dying wish is for Linda to keep his mustache, which she puts on her pet cactus. In Louise’s story, Bob tries to grow a mustache after being turned down by Linda at the bar. After trying everything he can think of Bob’s last hope is a wish from the robotic fortune teller at Wonder Wharf. Unfortunately for Bob it’s out of order and he’s forced to ask Teddy, who is repairing it, to grant his wish. Bob gets his mustache and his date with Linda. 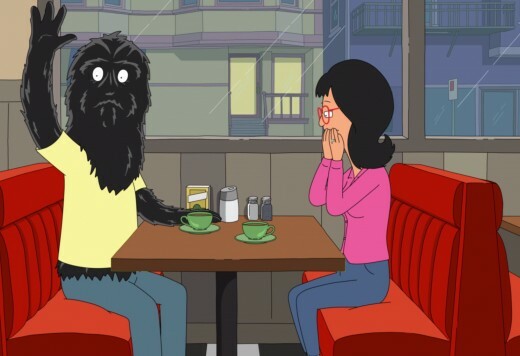 However while they’re out on the date Bob’s body hair starts growing out of control until he becomes a hair covered freak. Linda tries to help by shaving Bob, but the hair grows back almost immediately. Bob joins the freak show at Wonder Wharf resigning himself to life as a freak. Linda joins a convent because she thinks it will be like the sister act. She gets kicked out and ends up in Jail. Tina’s story ends up being the most horrific, mainly because it’s the most realistic. After several false starts as a result of trying to force Bob and Linda together, Tina realizes that if Bob and Linda didn’t get together, Linda would have married Hugo. Because Hugo is happy he pursues his dream and opens Hugo’s Hotdogs.They have three children, who look similar to the Belcher kids, but lack the personality that make them interesting. Bob, who had his heart broken by Linda is a health inspector. Bob and Ron come to investigate a disturbing rumour that Hugo makes his hotdogs with actual wiener dogs. Linda realizes she should have been with Bob, but Bob doesn’t take the hint and they remain separated. Hugo confesses that the rumour is true and the restaurant is shut down. In the end Bob realizes that the exercise bike has been squeezing his private parts, causing testicular failure after Gene tries the bike. 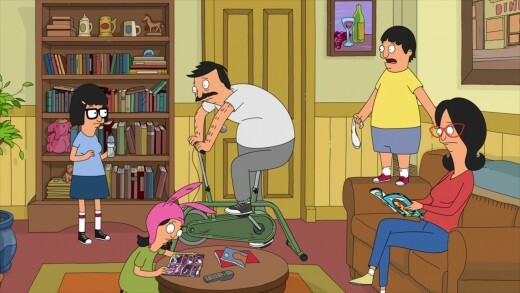 Bob then decides to give up using the exercise bike, so that his mustache can return to its former glory.